A week ago I took a look at issues & candidates facing voters in St. Louis City on August 7th, today is a brief look at St. Louis County. Brief because St. Louis County is highly fragmented with many municipalities, school districts fire protection districts, etc. The County’s ballot content report is 36 pages! County voters can click here for a page that’ll show a sample ballot based on their address. Ballots for each voter isn’t that long, so be sure to review your ballot ahead of time & vote on August 7th. As last week, I suggested voting no Proposition A.
U.S. Senate & state-level candidates are the same as lsat week. U.S. House District 1 & State Sen District 4 are also in part of St. Louis County. Speaking of U.S. House 1, last Saturday night we attended the birthday party & rally for candidate Cori Bush. The main guest was Alexandria Ocasio-Cortex – the 28 year-old who defeated a 10-term incumbent in NY’s 14th U.S, House District. Both women are considered new faces of the Democratic Party. 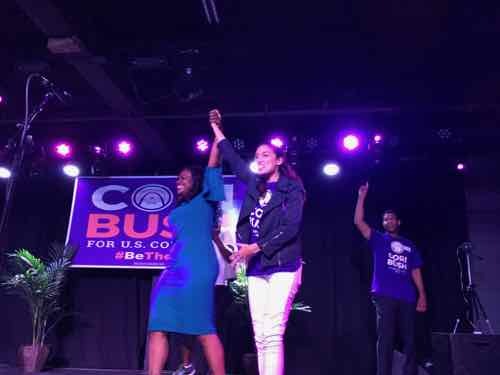 Cori Bush (left) and Alexandria Ocasio-Cortez (right) at The Ready Room on Manchester. The following morning Ocasio-Cortez was on Face the Nation with SEn. Bernie Sanders, both in Kansas campaigning for progressive Democrats. The main race is for the Democratic nomination for County Executive. The television ads for Steve Stenger and Mark Mantovani have been relentless and brutal. I think they’re both right about the other. Will the 3rd candidate on the Democratic ballot pick up votes out of distaste for the two big rivals? The race that might have a bigger impact is for prosecuting attorney. Ferguson councilman Wesley Bell is challenging Robert McCulloch. Illinois’ primary was back in March, so television ads for governor will just increase between now and November 6th.